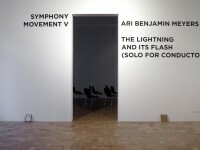 Movement V of SYMPHONY is the premiere performance of Ari Benjamin Meyers' original score,The Lightning and its Flash (Solo for Conductor). As conductor, Meyers will perform his score before an audience seated like an orchestra. The score functions formally as a composition, employing musical nomenclature to describe with a minimum of information what is to be conducted. Yet the resultant work is silent, relying on the movements of the conductor rather than sound to convey the composer's "music". The Lightning and its Flash (Solo for Conductor)is, like any conventional music score, open to interpretation by the performer (who in this instance is also the conductor). 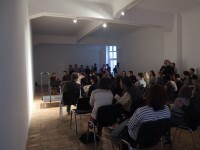 The work demands that the audience step out of its typically passive role to perform, as each individual will create or "hear" his own score, directed by the conductor. 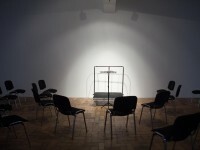 Like "the lightning and its flash" described by Scherchen, the materialization and conception of the score is a single act shared by conductor, performer and audience.